NETWORK UPDATE: BIG BROTHER and CRIMINAL MINDS each gained 0.1, but not EXTANT. However, that show was able to claim victory at 10PM, because TAXI BROOKLYN lost 0.1. The NASHVILLE: ON THE RECORD rerun gained 0.1, for what it’s worth. 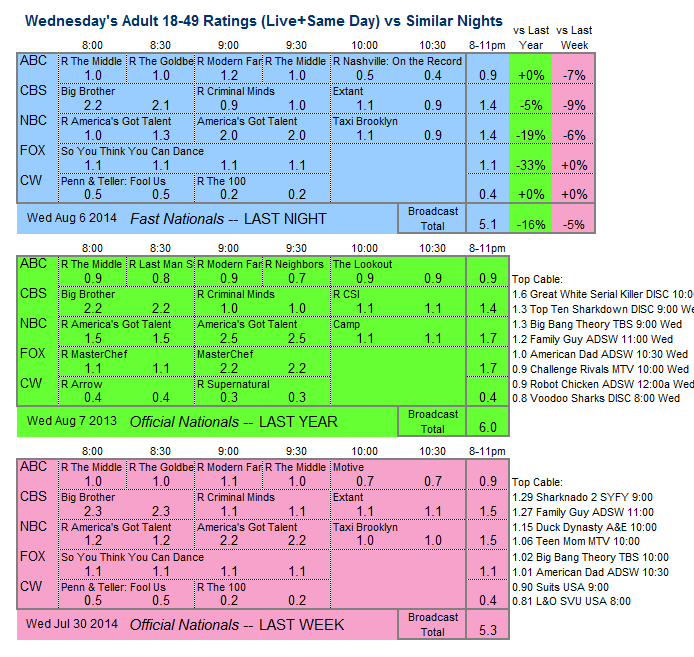 WEDNESDAY CABLE: DUCK DYNASTY (A&E) and TEEN MOMS (MTV) were almost exactly equal with last week at 1.16 and 1.03. 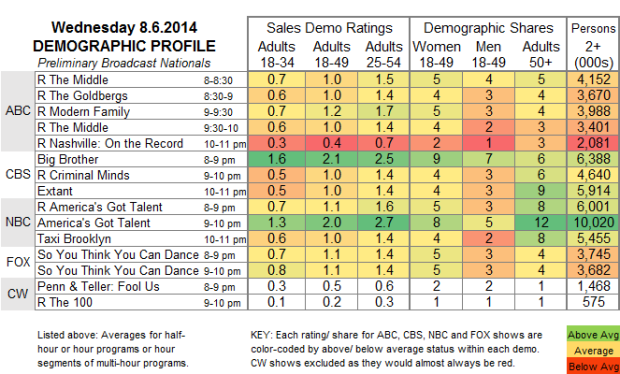 On USA, SUITS fell almost two-tenths to 0.72, while GRACELAND was very steady at 0.46. THE BRIDGE (FX) slipped a bit to 0.32, with 939K total viewers. On ABCFamily, both YOUNG & HUNGRY and MYSTERY GIRLS were down, to 0.41 and 0.17 (total viewers at 847K and 389K). On TVLand, HOT IN CLEVELAND and JENNIFER FALLS both crept up to 0.23/0.17 (total viewers 998K and 768K). WILFRED (FXX), nearing its end, was at 0.12 (170K total viewers), while THE DIVIDE (WE) skewed overwhelmingly old, with a nearly invisible 0.03 in 18-49s, but a downright robust 0.34 in Women 50+ (and 322K total viewers). NOTE TO READERS: Starting next Tuesday, look for a more comprehensive report on nightly cable ratings, with unmatched demographic detail, here on SHOWBUZZDAILY. The summer’s big 2 continued their reign last night. CBS: BIG BROTHER fell 0.2 from last week, but its 2.1 was the highest rating on any network last night. EXTANT, which has been further demoted out of its originally scheduled finale during September premiere week (it will end a week earlier), dropped 0.1 to a new low 1.0, tying the CRIMINAL MINDS rerun that preceded it. NBC: AMERICA’S GOT TALENT, like Big Brother, was off 0.2 from last week (to 2.0) but still strong. TAXI BROOKLYN is currently at 1.0, which would tie last week’s final number, but the show tends to lose 0.1 in the afternoon adjustment because of its lead-in and 10:01PM start time. The night started with an America’s Got Talent rerun at 1.1. ABC: The network took a rerun of its NASHVILLE: ON THE RECORD music special at 10PM with a subpar 0.4. MODERN FAMILY led the sitcom reruns at 1.2. FOX: SO YOU THINK YOU CAN DANCE was steady at 1.1. CW: PENN & TELLER: FOOL US remained at 0.5. Tonight’s action is on cable, where Syfy has the 90-minute season finale of DOMINION, and IFC premieres its quirky comedy GARFUNKEL & OATES.